The date was November 24th, 2018, a Saturday. After an exceptionally windy mid-week cold snap that had caused us to be unable to fish on Wednesday, we stayed an extra day on our trip to compensate, and it payed off big. It was around 6p.m. 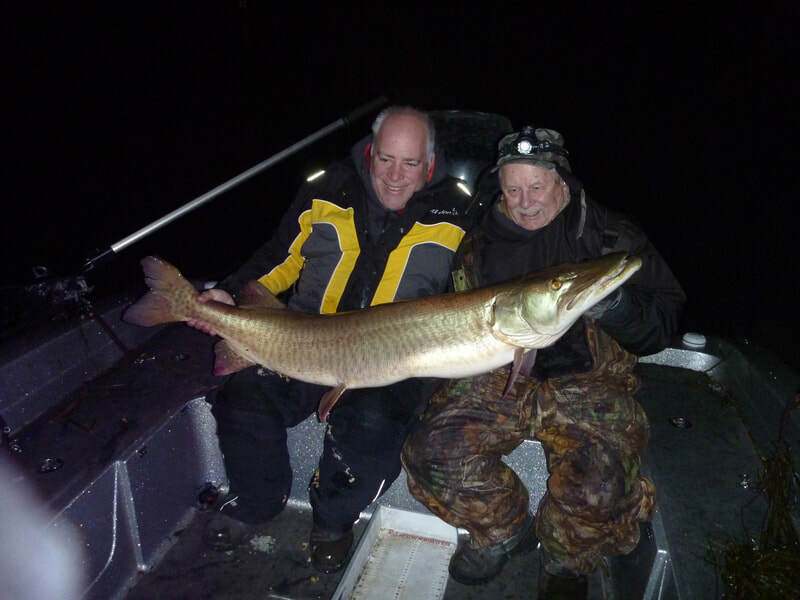 trolling the Ontario waters of the St. Lawrence River, when the graph indicated a large fish below the boat. The boat was grinding thru small floating ice chunks and Captain Mike Lazarus (the brains behind our success), stated that “It will never hit with all that ice noise”. Just a bit later however, the boat cleared the last of the ice and shortly after that, the reel went off and the chaos ensued. My fishing buddies Klaus Trieb (who had gotten a 56 1/2-inch, 48-pounder from the same area five days earlier) and Patrick Delaney, quickly cleared the other rods and the fight was on. The huge fish went immediately to the bottom in 30 feet of water and dogged it out from there. I first thought that the reel drag was too loose as cranking the handle retrieved no line…she was locked down tight. I tightened the drag three times to finally begin gaining line, but quickly loosened it again not taking a chance after the Captain admonished me about it. 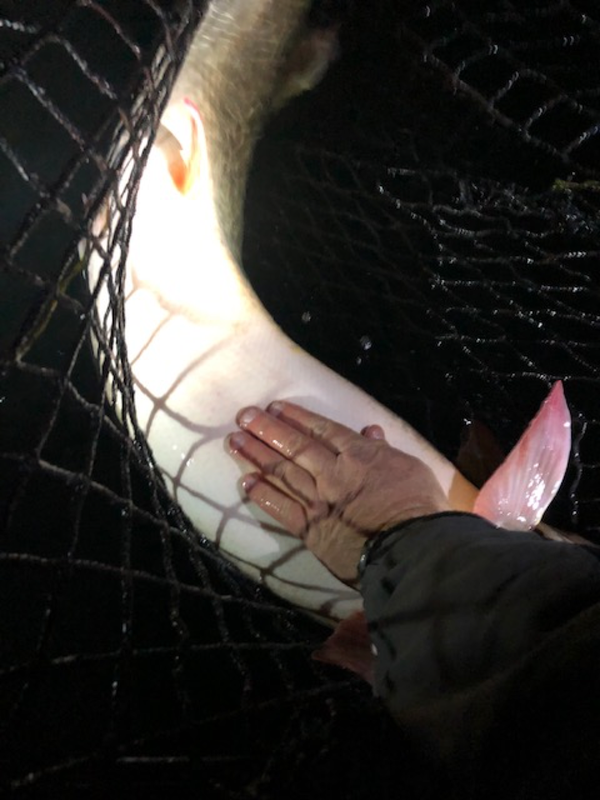 While not a terribly long fight, it did take several minutes to get the big girl to the surface, where we could see that it was indeed a good fish, but we had no idea how big. 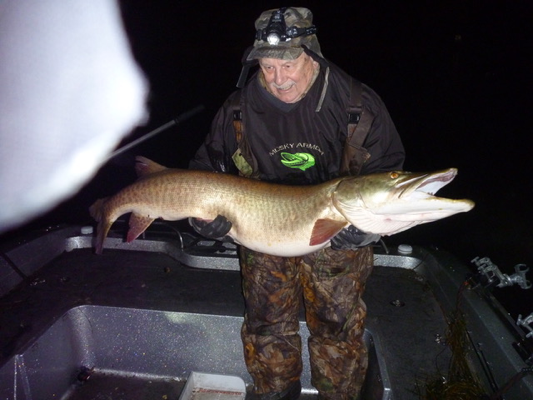 After a brief battle on the surface, I was able to lead the muskie into the waiting, none too big, Frabill “Big Kahuna” net. It then became apparent to me that she was a very long fish, with a very wide back and bulging belly! The black and orange jointed Bucher Depth Raider was firmly affixed in her jaws and she was unlikely to have gotten free short of breaking the line. After removing the hooks, the Beast was, at great effort, lifted into the boat and picture taking began. After quickly taking pictures,we then placed her on the Muskie Bumper “FatBoy” bump board, which is 10 inches wide (and the muskies tummy still hung over the edge of the board by an inch or so), where, when the tail was swept across the board and the tip of the lower tail lobe was straightened out, she measured exactly 57.25 inches long. We then weighed the fish on a certified digital scale. We were amazed when she pulled the “zeroed” scale down to 54.40 pounds (54# 6.4 oz.). She was then quickly released back into the river and immediately swam away strong. Needless for me to say then, that I was overjoyed!! My personal best in both length and weight after 64 years of chasing this “Noble Beast”. 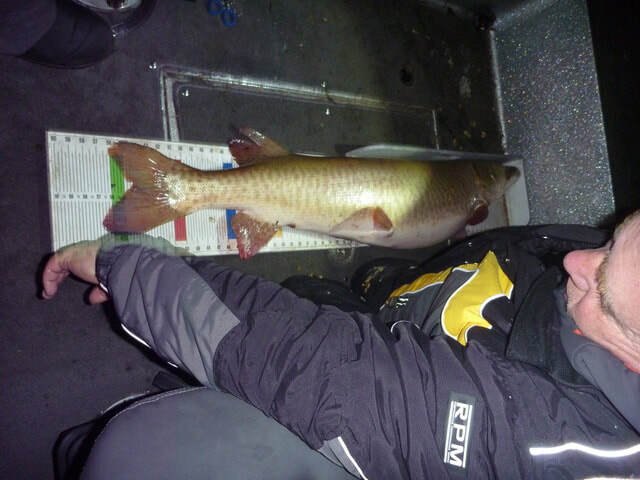 Believing that our Hayward Lakes Muskie’s, Inc. Chapter length record was 57 inches, ironically caught by my grandson Caiden two years before from Lake Vermilion, MN, I had, unless there was a longer fish caught by a chapter member that I was unaware of since, just set a new chapter length record. 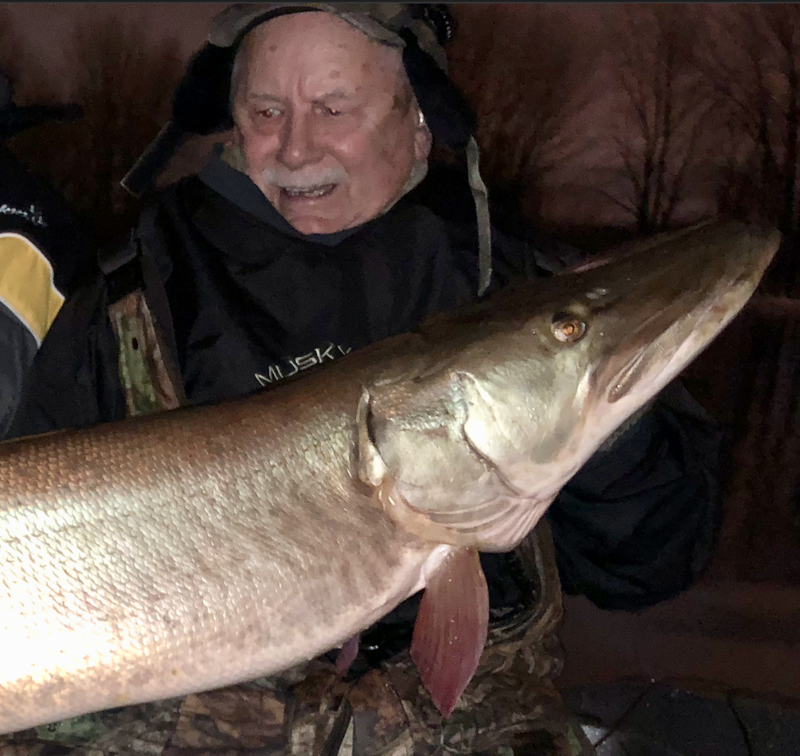 After giving it further thought, I realized also, that this fish weighed two pounds more than the Muskie’s, Inc. 52-year certified International historical weight record. However, MI does not allow released fish to compete in the weight division. 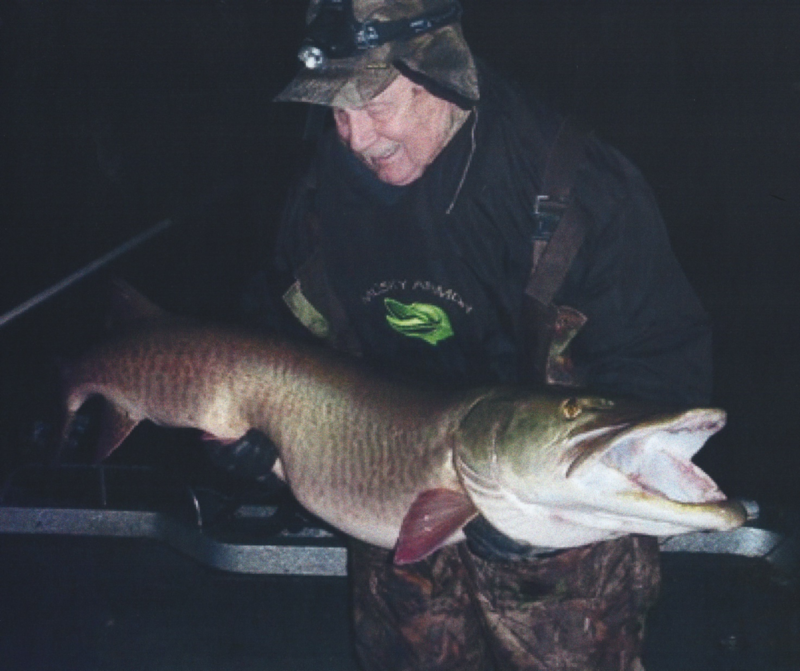 While I am sure there have been a fair number of muskies caught and released by MI members that would have exceeded the current 52-pound 6-ounce MI weight record caught in 2002, from the St. Lawrence River by Gale Radtke, I don’t know of any that were weighed on a certified scale and submitted to MI. 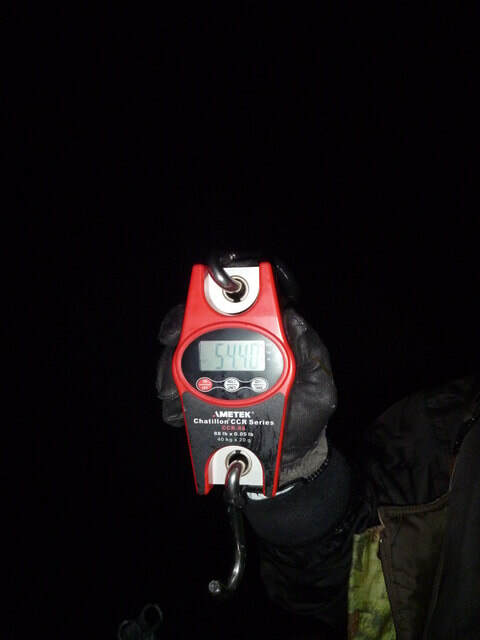 On December 5th, 2018, I had the scale that I used to weigh the fish (the official scale of the Modern Day Muskellunge World Record Program, www.modernmuskierecords.org) checked by the Wisconsin Department of Weights & Measures and it was found to be “dead on” with “zero” deviation.